Friends from a past life?! who says living things are not connected with each other...? 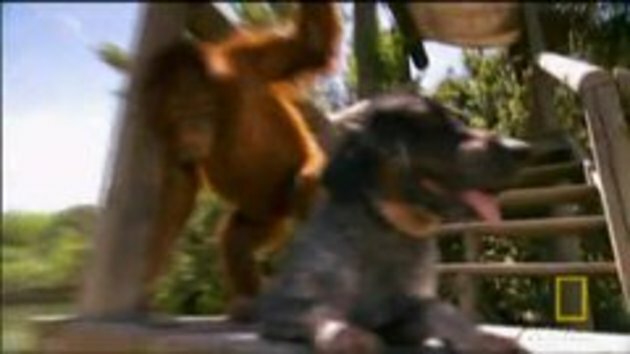 2:38 "Give the orang utan a candy..it will break it in half and hands you back one half"
im so jealous on those guys..i wanna work on a habitat with elephants and monkeys too..gives you a feeling what real life is about..
Do you think that hound dog is haunting them ?? oh man, that is really phenomenal. and we humans call ourselves rational..
great movie, thank you snotr ! Man tho, the owners must be dammmmmmmmn rich..
And seemingly not only moneywise..
now this is a beautiful video. Not like the weird cat and dog licking each other. Cool vid, but just a publicity stunt if you ask me. I give this Orangutan 1 APEhead! The orangutan obviously is not able to walk 10m without rolling. He'd be great for a jackie chan movie! Awesome video, keep 'em coming!! hilarious when I watch the orangutan rolling on the ground, smile, n hug the dog. Hahaha.. it's so funny, with funny faces and funny actions. I live in Malaysia, and orangutan is specifically originated from Borneo. Orangutan, or in Malay language, orang utan (english translation: forest's people) is a rare species of monkey's family. That was so cool!! A very sweet story!! #3 I agree with you completely!! The dog is like "i have enough, thanks"
And the monkey "No no, u got eat all u food"
What a great video! I'm with #3, I want to work there!